Belize has always been somewhere I have wanted to live so I have to say I was quite disappointed with the place. It's very expensive and felt quite dangerous in places, especially Belize City. We moved rapidly onto Caye Caulker an offshore island from where we could dive the famous Blue Hole a very deep sink hole with columns and stalactites down at 40m. This was our deepest dive ever and we saw huge Bull Sharks and mighty groupers. The dive was over quickly but we did have 2 more that day at different sites which made up for it. There are loads of travellers on Caye Caulker so, once again, plenty of bars and restaurants for us. We met some nice Swedes here, who we were miraculously to meet again in Mexico City weeks later. It's quite common to bump into people you know when travelling like this. 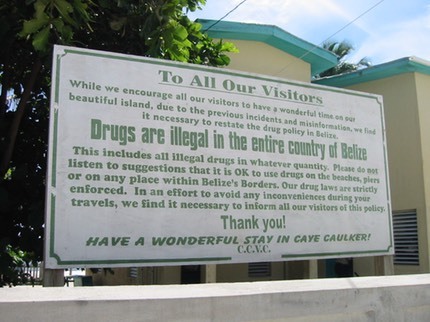 Belize did not offer much photographically but this sign amused us. 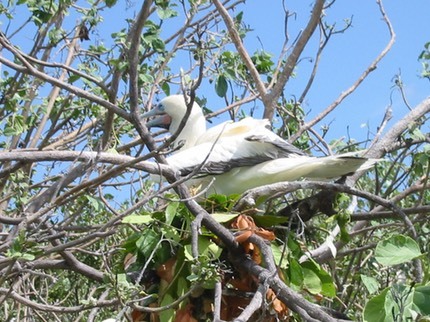 We did get to visit an island that had breeding colonies of Red-footed Boobies. Not the easiest of the "boobies" to find so this was a good trip for me.